for LUVO here. Before I get to my review of two LUVO frozen entrees, I need to start with the disclosure that I'm an investor in LUVO -- all the way from a few years ago when they were just raising capital in Canada to launch the idea. Now they are all over the US, and you can even buy bulk packs of LUVO online from Amazon (shipping to US addresses). They launched last year in Canada at classy supermarkets (Whole Foods!) 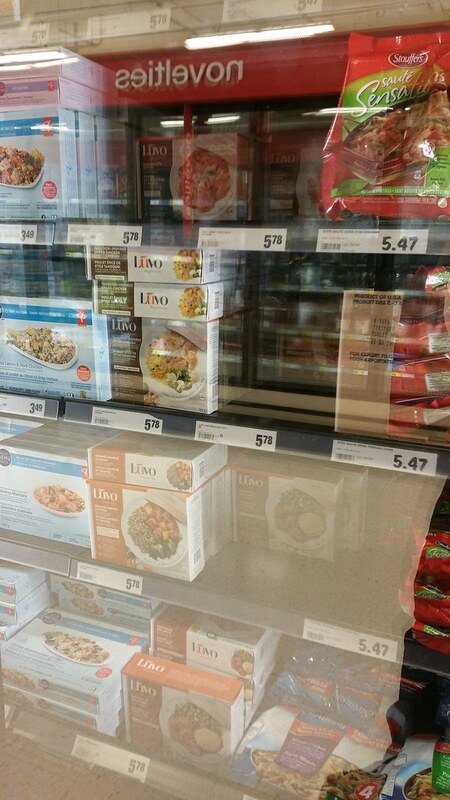 for the health-conscious demographic, and LUVO is even more widely distributed now in stores like Urban Fare, IGA, and even Superstore. I chose to get it from Whole Foods at Cambie and 8th because it was close to where my friend and co-eater in this investigation lived. Each pack was $7.99, and you can save $0.10 off your transaction if you bring your own bag (or you can donate it to charity (probably one of theirs, like the Whole Planet Foundation or what not) -- they ask at the till and handle it for you). Clearly if you buy things here, buy bring lots of friends and buy each item separately for a flat 10 cent discount per item. LOL! 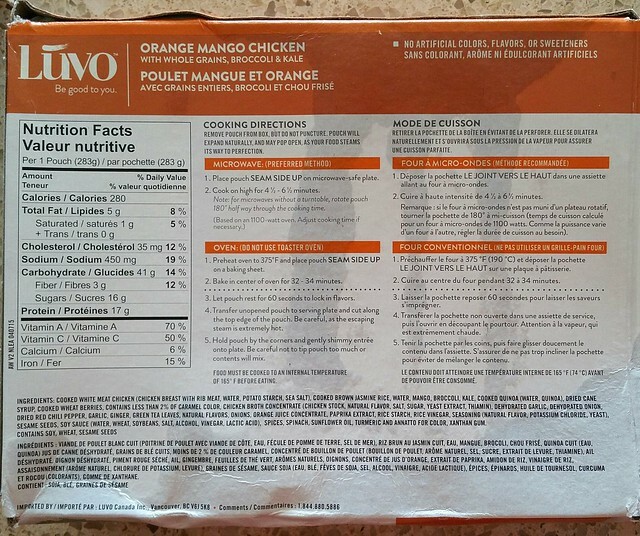 At the till I noticed that the box for the LUVO Orange Mango Chicken was a bit soggy at the back (see picture below). This was possibly a sign that it had partially thawed at some point. Not sure how this would have affected things, but later when I opened the bag, it felt and sounded like the contents were still iced solid. Nevertheless... something to watch out for? 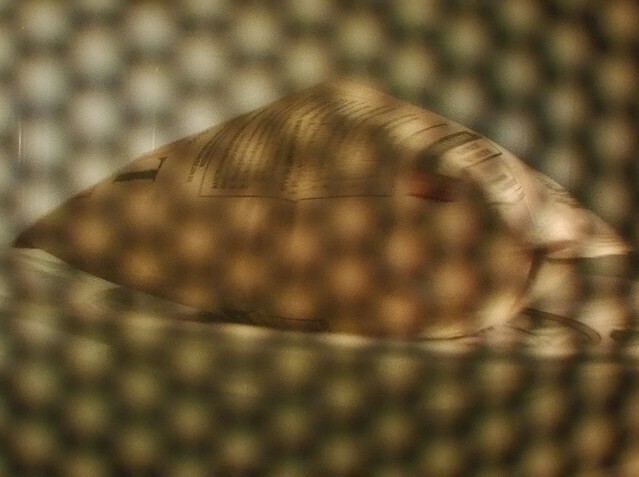 Microwaving instructions are slightly DIFFERENT in microwaving times. I went with the microwave instructions and set it for the average time. Oven instructions of over a half hour presumably try to make sure the item is steamed to regulation internal temperature. Which I didn't check. 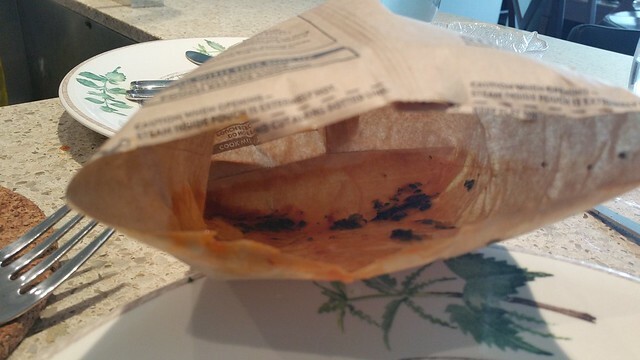 While microwaving, the bag puffs up like a bag of popcorn. In fact, at the peak the seam opened up and I could hear the steam hissing out. Because there was this release, there really wasn't any fear of explosion, though I was mildly worried about sauce spray in the microwave. Fortunately that didn't happen. Also surprised that a pair of scissors was necessary. 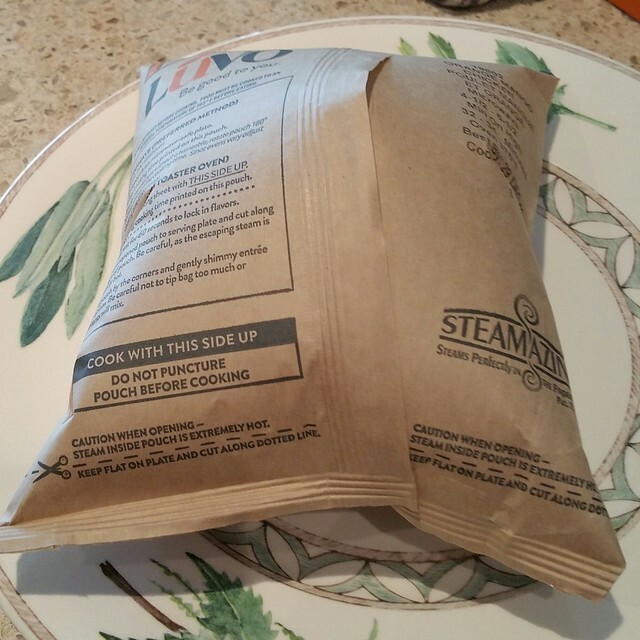 I'm sure it has to do with how the product comes out of the bag, but c'mon -- You don't need it for microwave popcorn! I took care about the steam but there was nothing to fear as the pressure was presumably released at the top and during microwaving. Per instruction, I let the meal slide out onto the plate, and it did in fact plate quite prettily for a microwave dinner. Colours and freshness of the items was obviously not exactly as shown in the picture, which looks more like something a restaurant would be proud to bring out. 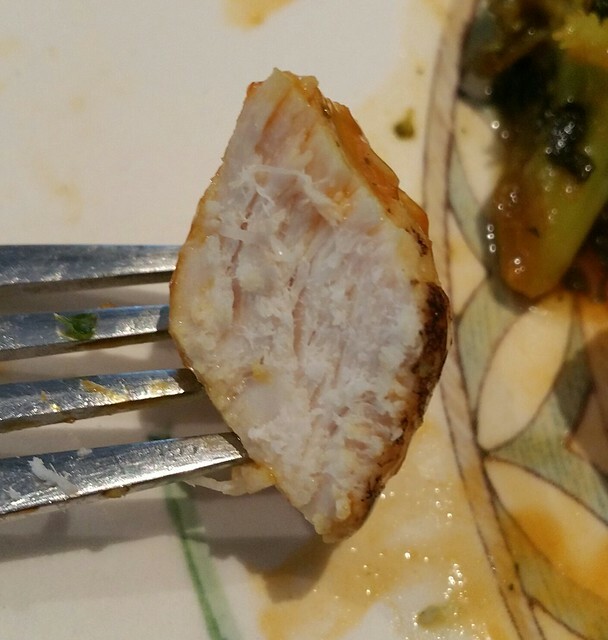 Below you can see a cross section of the white chicken breast meat, which turned out reasonably tender and moist. Overall, the taste of the Orange Mango Chicken was pretty decent. It's definitely low in saltiness, enough that you might find it on the bland side. So the best strategy seemed to be to make sure I paired each bite of rice with veggie or chicken of fruit, plus whatever sauce I could mop up. 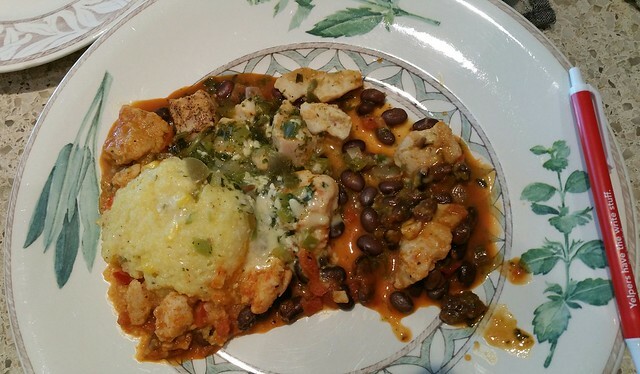 Portion looks a bit smallish but you do get heavy chicken breast meat and grains in there so there's room for dessert after, unless you are a growing teen or hungry hockey player. Polenta cake came out okay but everything else sort of slid apart. Looks like we got more sauce here than with the Orange Mango Chicken. Polenta very plain and bland so make sure to eat it with bites of something else. Sauce makes this taste saltier but it's probably just the mix of flavours. Like the previous item, chicken chunks would look more impressive if they were bigger, just like in the picture. Overall this was tastier for being more flavourful. 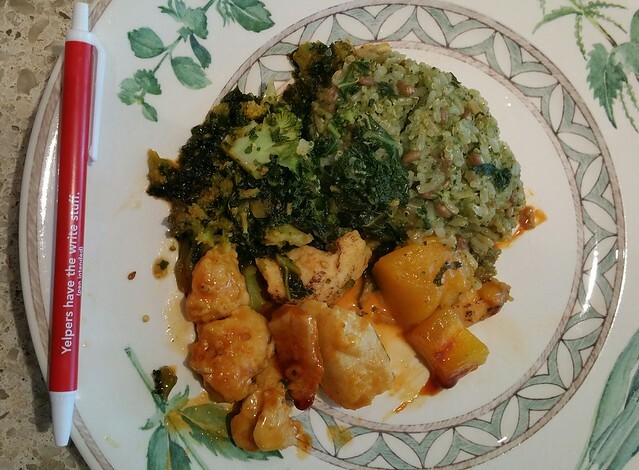 With the Orange Mango Chicken, if you ran out of fruit I think you were sort of in trouble for taste. 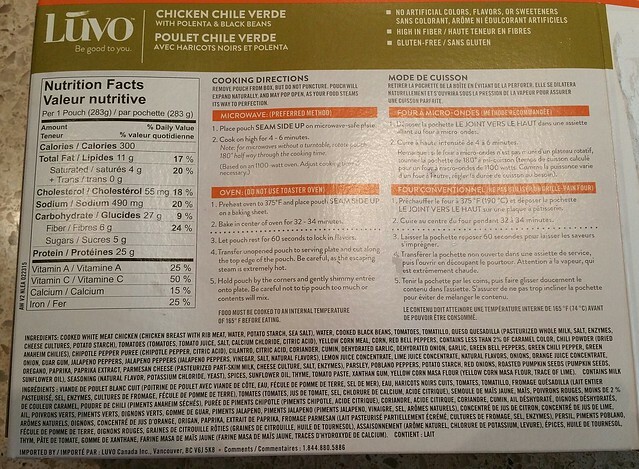 If you sift through the considerable reading, there's lots to like, such as gluten-free (in the case of the Chicken Chile Verde); chicken raised without antibiotics; veggie content; no artificial colours, flavours, or sweeteners; low sodium; and not a lot of mysterious ingredients (Guar gum? Xanthan Gum?). As far as frozen meals go, LUVO offers a more stylish plate and perhaps most importantly the semblance of a sophisticated restaurant meal -- plus it's hopefully a balanced and healthy one with carbs and protein. Plating is much better and more appetizing than frozen dinners in plastic compartment. Not as picture perfect as the ad copy, of course, but really decent for something you just slide out of a bag with no assembly required. You can get coupons for LUVO here.